Krystal Evans at the Discoveries Need Dollars rally in Melbourne. Krystal Evans took time from her own research to help save funding for medical science. Australia had never seen it before: lab coats forming a sea of white as thousands of medical researchers gathered in protest. 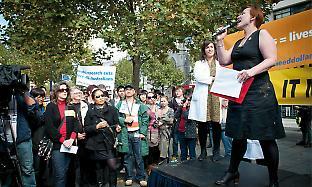 The largest rally, in Melbourne, was addressed by leading scientists, an MP, and people with genetic illnesses desperate for cures. But without the MC, Dr Krystal Evans, there might have been no rally and a lot less science funding in the Budget a month later. The Discoveries Need Dollars (DND) campaign was launched from the Walter and Eliza Hall Institute (WEHI) when rumours started circulating of a $400 million cut to medical research over 3 years (AS, May 2011, p.7). Scientists nationwide responded with petitions, media releases and by contacting their MPs, spurred on by social media. Evans was approached by the president of WEHI’s student society, David Riglar, about organising a rally. The pair tested the water with emails asking whether people would come. The response was overwhelmingly positive. Before a decision could be made messages had gone viral and Evans was being bombarded with emails from other research institutions demanding to know why they hadn’t been invited. DND authorised the event 5 days before the rally, and Evans and Riglar went into overdrive. “I’ve never organised a rally before,” she says, although she had organised much smaller events for the postgraduate association during her PhD. Friends provided logistics advice, and Evans put her social media skills to advertising use. When contacted by people from other states she encouraged them to organise their own rallies and shared designs and slogans. Evans flew to Canberra during Budget week to present a 12,000-person petition to Adam Bandt, whose Melbourne electorate includes Parkville’s medical research precinct. Bandt had championed the campaign and spoken at the rally. “I’m excited that we not only got funding maintained, but we got a strategic review,” Evans says of the Budget outcome. “We don’t want to do this every year.” Nevertheless, she believes the campaign empowered early career researchers and adds: “I’m excited to see where the campaign will go next”. Her PhD at WEHI demonstrated that the malaria infection causes severe anaemia through the accelerated destruction of un­infected blood cells as well as reduced production of new cells. “My hypothesis is that it’s an inappropriate immune response, but it could be a tricky adaptation to withhold potential homes from the parasite,” she says. Distinguishing appropriate and inappropriate immune responses led her to vaccine research, and Evans is creating attenuated live vaccines against malaria. “This is the way the most successful viral vaccines have been produced, but no one has really tried it against malaria before.” Evans says this is because scientists have only recently identified the genes that need to be knocked out to make malaria less virulent. Her work has been funded by a Grand Challenges Exploration grant from the Gates Foundation. These are intended to fund ideas that are so radical they may struggle to get support from more conservative funding organisations. The rally’s microphone was familiar for Evans. During her PhD she was a guest on Einstein A Go-Go, a science show on radio 3RRR. “I was invited back, and for the last 2 years of my doctorate I was an occasional presenter. I really liked this because it forced me to read up on other areas of science, not just malaria,” she says. On returning to Melbourne Evans became a weekly presenter and revitalised the show’s social media presence.